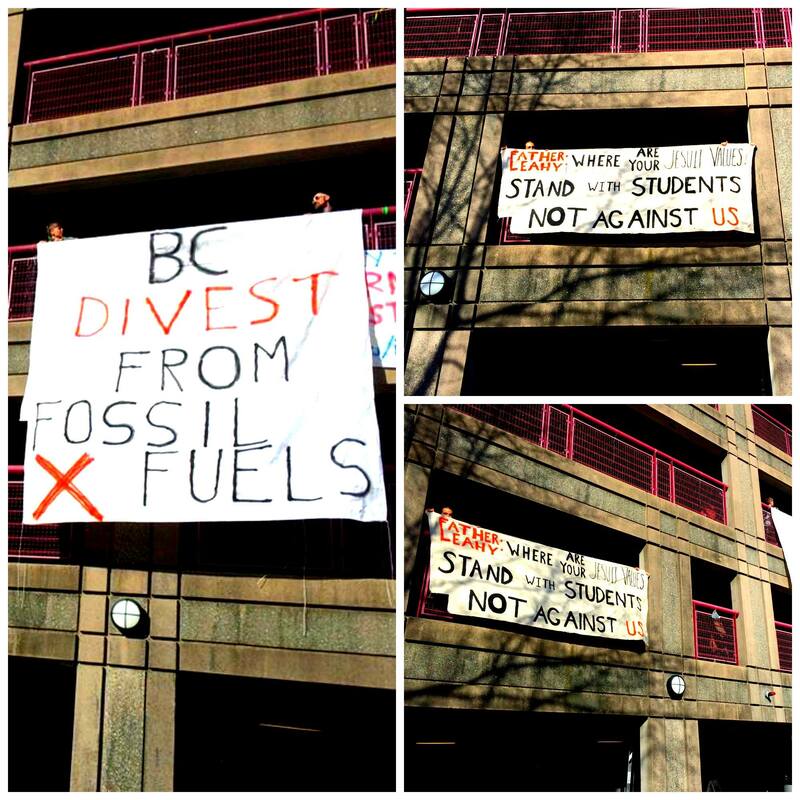 Climate Justice @ Boston College | Fighting Climate Change for a Just World. On Sunday April 12, BC Admitted Eagle Day, approximately 150 students, faculty, and community members from across New England converged onto the BC campus in protest of the suppression of free speech at Boston College. BC students, some already on disciplinary probation and worried of further repercussions, gathered for lunch together in Ignacio to distance themselves from the protest. The protest was a resounding success, followed that evening by a unanimous approval of the student group Climate Justice @ Boston College by the Undergraduate Student Government at Boston College (UGBC). Below are select photos, videos, and articles about the event. Newton News coverage of the event as their leading story on April 15, 2015. BC Students in Ignacio Hall wave to protestors as they march by through campus. The Boston community will be converging on the BC campus on April 12 in protest of the treatment BC students have received from their administrators, such as disciplinary probation for helping organize a peaceful vigil on campus. Upon denial of a permit, and for fear of further administrative backlash, CJ@BC will not be sponsoring the event – but off-campus community groups will be moving forward with the event.